When it’s time for a renovation in your home, there are several factors considered during the planning process. Will this renovation increase the value of our home? Is it a necessity to improve the functionality of the home or is it simply cosmetic? Will we still love these changes after they’ve been installed for six months? The sheer number of considerations can be quite overwhelming and can cause a delay in getting the renovations started. Fortunately for those who are simply looking for cosmetic changes, introducing a few new pieces of furniture or a coat of paint can make all the difference. One of the smallest changes to a bathroom that won’t break the bank is replacing your builder-grade bathroom mirror. With several styles and options out there, it can be overwhelming to choose which bathroom mirror will work best for your home. Modern bathroom mirrors come in a variety of shapes, sizes and budget points. 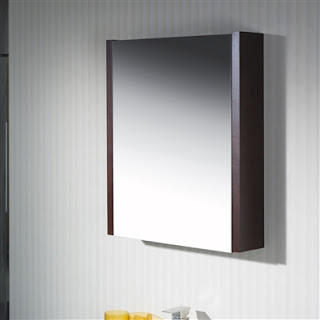 Here at Bathroom Place, all of our contemporary vanity mirrors are priced below $250. If you’re hoping to give your bathroom a modern and tech-friendly feel, consider installing a bathroom mirror with LED lights. The light illuminated from this frameless mirror can help with your grooming tasks or it can be used as a nightlight. These mirrors often look best in a monochromatic setting. Though not as popular as large framed mirrors, these LED light mirrors are gaining momentum in the modern design space. If high tech isn’t the style you desire but you do enjoy sleek modern designs throughout your home, consider adding a contemporary vanity mirror to your bathroom. This can be accomplished with a full-frame mirror. You’ll want to choose between a square full-frame mirror or a rectangular mirror that can be hung vertically or horizontally to match the size of your vanity. If you’re looking for additional storage space in your bathroom, adding a mirrored bathroom cabinet can help meet your storage needs. Keep your small toiletries, vitamins and other necessities out of plain sight. These modern mirrored bathroom cabinets are available frameless, recessed or with wood sides. You’ll want to choose one based on your current vanity so that both items complement each other. Mirror cabinets often work best in small bathrooms that are limited on space. They’re ideal for guest bathrooms that often have vanities with very little counter space. So which style of bathroom wall mirrors will work best with your current design theme? Comment below and let us know which style of bathroom mirrors you like best! Enhancing the available space in your bathroom is good idea to make the place more organized. mirror cabinets can therefore not only make bathrooms more comfortable, in fact they are loved for providing extra space as well.